Synopsis: For twelve-year-old Cora Landry and her friends Violet and Jordyn, it was supposed to be an ordinary sleepover–movies and Ouija and talking about boys. But when they decide to sneak out to go to the abandoned rail yard on the outskirts of town, little do they know that their innocent games will have dangerous consequences. Later that night, Cora Landry is discovered on the tracks, bloody and clinging to life, her friends nowhere to be found. Soon their small rural town is thrust into a maelstrom. Who would want to hurt a young girl like Cora–and why? In an investigation that leaves no stone unturned, everyone is a suspect and no one can be trusted–not even those closest to Cora. 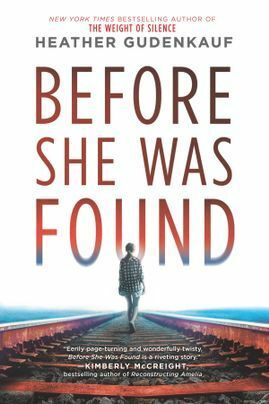 Before She Was Found is a timely and gripping thriller about friendship and betrayal, about the power of social pressure and the price of needing to fit in. It is about the great lengths a parent will go to protect their child and keep them safe–even if that means burying the truth, no matter the cost. Doesn’t this book sound SO GOOD?! TLC Book Tours and Park Row publishing have given me the opportunity to share an excerpt from Before She Was Found with you! Read the excerpt below and then check out the rest of the tour stops for more excerpts of this book. Also, check back in May for my full review of this book! They load us into the backseat of a police car telling me that in the time it takes for another ambulance to arrive we can get to the hospital. I hold Violet close to me, doing my best to keep her as still as possible as we wind through the countryside. The nearest emergency room is twenty-five miles away in Grayling and the officer is determined to get us there in record time and I’m worried that the bumpy ride will injure her further. I’ve given up trying to find the source of the blood that blooms across her chest but am fairly confident that she isn’t bleeding anymore. Instead I focus on keeping her eyes open and on me. Violet’s skin is a scary shade of white and she seems to be floating in and out of consciousness. She isn’t going to pass out—it’s not that—but every few moments a light seems to go out behind her eyes and she disappears into some unknown, private place. “Violet, honey,” I say, shaking her lightly. “It’s going to be okay, I promise. Can you tell me where it hurts?” No response. “Stay awake. Keep looking at me.” Her dark lashes flutter, casting fanlike shadows across her cheeks. I smooth her hair away from her forehead and tell the officer to drive faster. My mind is swirling with questions. Who could have done this? What kind of sick monster would attack two innocent girls? The injuries on Cora are horrific. Has she made it to the emergency room already? Is she still alive? I think of her parents and wonder if they have been called. Another girl, Jordyn Petit, was supposed to be at the overnight, too. Where was she? Was she attacked, as well? The air is filled with the earthy, rich scent of newly tilled fields. The once hard-packed ground now loosened and velvety to the touch. So different than the red soil back home. We are approaching the city of Grayling and the officer merges onto Highway 218 and vehicles move swiftly to the right so we can pass. Signs for the University of Grayling Hospitals and Clinics let us know that we are getting close. Traffic thickens the closer we get to the hospital and despite the sirens it feels like an eternity for vehicles to get out of our way. Finally, we pass by a handful of restaurants, the university softball fields and a number of university buildings. We arrive at the newly constructed children’s hospital, a beautiful structure built of steel and glass that rises high above the others. The officer bypasses the main doors and drives directly to the emergency entrance. “They are expecting us,” he says, pulling to an abrupt stop. I nod and rush through the doors, looking left and right for any sign as to where they have taken my daughter. She’s gone. “Are you the mother?” A heavyset woman rises from behind a counter. “The doctor is looking at her right now. Let me get some information from you and then we’ll take you back to her.” I answer her questions as quickly as possible and then take a seat to fill out the reams of paperwork. When I get to the section that asks for a list of family members I think of Max. I forgot about him. I pull my phone from my pocket. He still doesn’t answer and I shoot off another text to him telling him to call me immediately. “I’m going to kill him,” I mutter and am immediately sorry. How can I say something like that after what happened to Violet and Cora? “But all the blood…” I begin. “It’s not your daughter’s,” he says and I nearly collapse with relief. “I’m Dr. Soto. You can come on over next to her,” the doctor invites and I go to Violet’s side. I bend over her and lay the palm of my hand against her cheek. Her skin is cold to the touch. “Violet, honey,” I whisper, “what happened?” She blinks up at me and I see no recognition in her eyes. She opens her mouth but no words come out, only a weak croak. I think of head injuries, drugs and monstrous acts that might leave a child speechless. Panicked, I look to Dr. Soto, who has stripped the bloody gloves from his hands and drops them into a hazardous waste container. “I want to stay with her,” I say, bracing myself for a fight. There’s no way I’m going to leave her side. “Of course,” Dr. Soto says and drags a chair from the corner of the room and situates it right next to the examination table. “Judy here will take care of you. I’ll be back in just a bit.” Dr. Soto briefly puts a reassuring hand on my shoulder and exits the room. I sit down next to Violet, who still doesn’t seem to register my presence. Judy, a woman around my age with deep commas etched into the corners of her mouth, speaks to Violet in a low, soothing voice. “A little pinch here, Violet,” she says and I wince when she inserts a needle in the crook of Violet’s arm. She doesn’t even flinch. Judy draws several vials of blood and then sets up an IV drip of clear liquid. Then she reaches down with gloved hands and picks up Violet’s shorn clothing. I expect her to toss them into the wastebasket but instead she places them inside a plastic bag, seals it and affixes a label to the front. She reaches for a cell phone sitting on the metal tray and drops it into another bag and seals it shut. “Now I’m going to get you cleaned up, Violet. Does that sound like a good plan to you?” the nurse asks. Violet gives no indication that she hears the question. “Like Dr. Soto said, she may be in shock. It happens sometimes when there’s a traumatic event. You’ll come around, won’t you, Violet?” The nurse smiles down at her. “We’ll have you sitting up and talking in no time. But for now we’ll keep you warm and get all cleaned up.” The nurse holds up a small blue hospital gown. “First thing we’ll do is get you into this lovely outfit.” Judy deftly dresses her, nimbly shifting Violet’s weight so she can button the gown into place. Violet is nearly swallowed up in the fabric. You’re right, this book DOES sound so good!! Thanks for featuring this excerpt! Thank YOU! I cannot wait to pick this book up!